1 drawer L: 29" X W: 15" X H: 8"
I bought this bed in the grey and it is beautiful. The grey is a deep charcoal, darker than it appears in these images. The bed is very tall at 70 inches and adds a lot of drama. 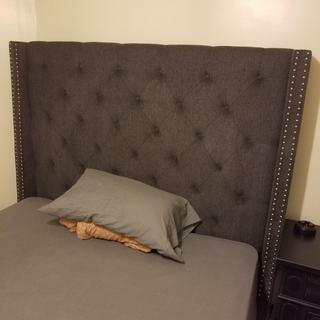 The tufting is very well done, and the nail studs are beautiful and not cheap or tacky. The only downside is the drawer does not like to stay shut! It’s always opening, which is annoying. I will buy heavy duty Velcro and see if that does the trick. Drawer aside, it’s a great bed and I’m very pleased. Would recommend! 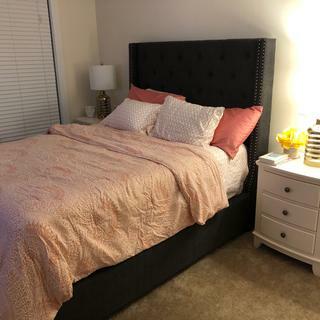 I’ve only had the bed for two months but so far am in love with it. It was delivered and assembled by R&F and it’s been quite the statement piece in my bedroom. The storage works well for me as I don’t have a lot of storage options in my apartment and I enjoy a bed with many pillows. The bed doesn’t require a box spring and has wooden slats. I purchased a 10 inch mattress and have had no issues. I don’t feel the slats and the bed is sturdy. I used scotch guard to keep it from staining right away but the color is pretty dark. I really like this bed. You won’t be disappointed. High quality bed frame at an unbelievable price with out breaking your bank for the look of expensive taste. 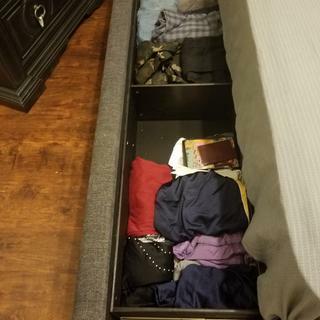 The two draws in front of the bed frame was the icing on the cake to receive additional storage space that goes beyond saying. I'm highly encouraging everyone to RAF. Love this bed. So stylish and fits perfectly. The drawers are great for storage. We love the bed and service by the rep was amazing. Thank you Raymour of hicksville. 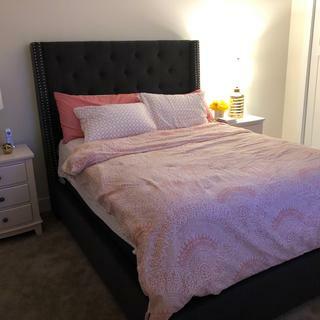 we love the bed and looks amazing. I love this bed! Beautiful design + delivery & assembly was exceptional! Buy this bed! 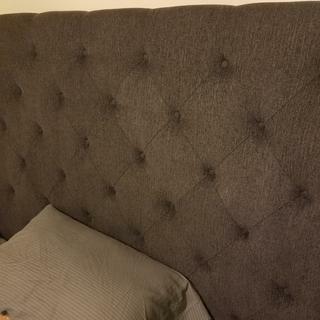 I love my headboard. It blends in with the color of my room! A little darker than the photo but preferred. I love my bed, its very sturdy and great Quality. The front storage is very useful. Love my bed, storage is very useful. Study frame , love it love it ! I just purchased this time, and all I can say is that I love everything about it, except the face that the storage compartment will not shut completely.. is there any one else with this problem, if so how did you fix it? We apologize this has occurred! If you could, please email us at rfcare@raymourflanigan.com with your order detail, contact information and a copy of your concerns, we would be happy to see how we can help. Wasn’t my first choice but it worked out perfectly for the space and win with the large amount of storage drawer space. 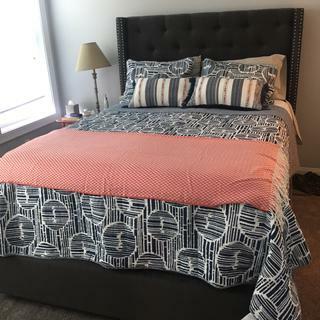 Solid bed, nice color, and the design gives it a little something extra. 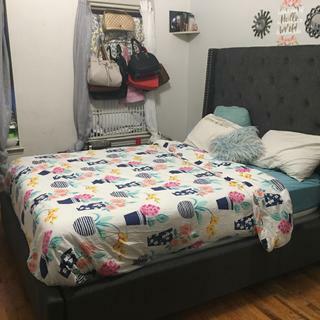 Does the bed frame have wooden slats (multiple) or just the standard 3 support beams? BEST ANSWER: It has multiple slats and 2 drawers at the end of the bed. Very happy with my purchase. Multiple wooden slats. It’s been a great choice for me so far. I bought in August 2018.
it has multiple wooden slats across the bottom. it is a sturdy bed. I love it! Yes. The bed has multiple wooden slats for support. is this bed delivered in sections? BEST ANSWER: Hi Jennifer, thank you for your interest int he Quinn Queen Storage Bed. With Raymour & Flanigan's White Glove Delivery service, delivery includes all necessary assembly and a comprehensive quality inspection of your furniture prior to it being delivered to your home. Some pieces may require final assembly in your home due to their size or configuration. 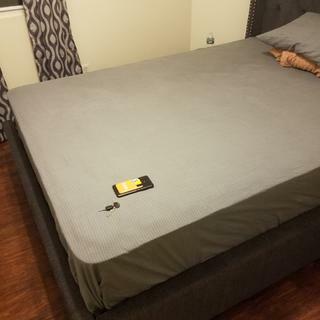 Will any queen mattress work with bed? Does the length of 91" reflect open or closed drawers? BEST ANSWER: The length of the Quinn Queen Storage Bed is 91" with the drawers closed. Can you use a bunky board for this bed? BEST ANSWER: Yes you can use a bunky board, it will have the support. 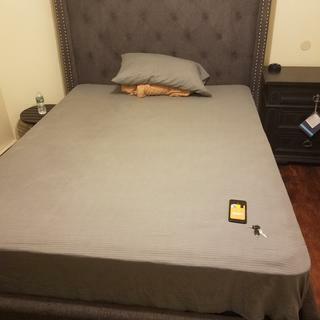 Does this bed support a box spring and mattress or just mattress? BEST ANSWER: Hello Elizabeth, thank you for your interest in the Quinn Queen Storage Bed! A box spring is not required. Can I use an adjustable base with this bed? BEST ANSWER: Hello Asia, thank you for your interest in the Queen Storage Bed! A regular adjustable base is not compatible with this bed, however we do offer an adjustable base specifically designed for platform beds, called the Freestyle. There are multiple slats included on this storage bed but you may want to consider purchasing a bunkie bed that provides additional support. If you have specific product details, please contact our online sales department at 866.383.4484, option 2. We would be happy to assist you! 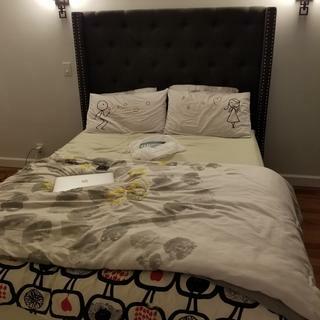 Can you buy the rest of the pieces in the picture with the bed? BEST ANSWER: Yes, most of the pieces you see in the room shot image are Raymour & Flanigan products (Please see attached items). We do not sell the larger pillows or bedding. I will get back to you shortly on which rug is used! How deep front to back are the inside of the drawers? BEST ANSWER: The dimensions of the footboard drawer are L: 29" x W: 15" x H: 8"